Note: Make sure to manually delete the UAD device drivers & preference files as described below. 1. Click the Start menu icon in the bottom left corner of your screen and type in "control panel". Click on the top result in the list to access the Control Panel. 2. In the Control Panel window, click on "Programs and Features". Note: Your Control Panel window may look slightly different depending on your computer manufacturer and version of Windows, however the "Programs and Features" option will still be available. 3. Scroll down until you locate "UAD Powered Plug-Ins" in the list, then click on it and select "Uninstall" from the menu bar. 4. 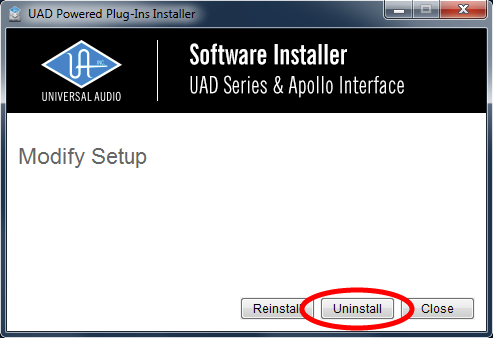 Click the “Uninstall” button in the UAD Powered Plug-Ins Installer's Modify Setup window. All UAD software is deleted and the software uninstall process is complete. Each UAD device has a unique device driver. If more than one device was installed, each driver file must be individually deleted. 1. From the Windows Start Menu, select Control Panel > Device Manager to open the Device Manager window. 2. Click the disclosure triangle next to the "Audio DSP Accelerator" item to expose the individual UAD device drivers. 3. Right-click on the UAD driver and select "Uninstall" from the contextual menu. The Confirm Device Uninstall window appears. 4. Click the "Delete the driver software for this device" checkbox, then click OK. The device driver is deleted. 5. 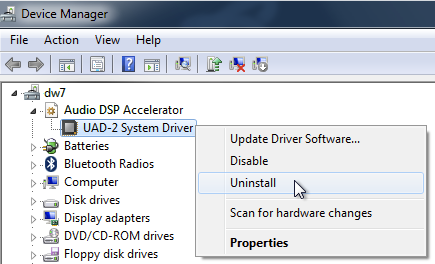 For each UAD driver under the "Audio DSP Accelerator" item (if any), repeat the above two steps. If prompted to restart the computer, it is not necessary to do so until all entries are uninstalled. Device driver uninstall is complete. Important: Console sessions are stored in the same location as the UAD preference files. If you wish to keep your current Console sessions, make sure to move the 'Sessions' folder out of the Universal Audio folder before deleting the Universal Audio folder itself. Once you have reinstalled, simply move these session files back to the 'Sessions' folder inside of the Universal Audio folder. If you are not using an Arrow or Apollo audio interface (or do not have any Console sessions that you wish to keep) you can delete the entire Universal Audio folder.